My colleagues Bryan Young and Bobby Roberts (who most of you will know from Full of Sith) are fond of saying that to fully appreciate Star Wars, one might be best served by consuming the media that its creators consume. I often found that to be true, and have always tried to bring my insight–such as it is–to bear on the plethora of homages and callbacks that Star Wars Rebels has employed over the last 4 years. 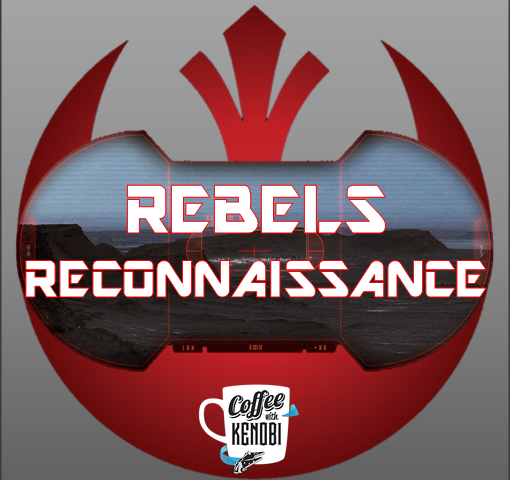 It is to this end that I would highly encourage you to revisit two of Steven Spielberg’s seminal works, Close Encounters of the Third Kind and the Indiana Jones series, to see their influence on this week’s pair of episodes of Rebels. “Wolves and a Door,” the first of these offerings, begins with our heroes facing the problem of reaching the Jedi temple on Lothal, but a solution is close at hand. Ezra’s burgeoning connection to nature has been a consistent theme throughout the series and is another thing that is paying off as Rebels winds down. Having already established a rapport with the mysterious Loth-wolves, Ezra calls to them here and the mammoth lupines transport them the great distance through a type of “Force-portal.” It’s a beautiful sequence that delicately balances majesty and humor as Hera, Zeb, Sabine, and Ezra ride atop the wolves, while Chopper bounces along in the mouth of Zeb’s mount. Arriving at the Jedi temple, Ezra and Sabine don Scout Trooper disguises and make their way down into an Imperial archaeological dig, while Hera, Zeb, and Chopper remain above to act as lookout. The lighting and positioning of the lookout is Close Encounters to a tee, but once the focus shifts to the dig itself and the music swells, everything feels like Raiders of the Lost Ark. The Indiana Jones films always blended hard science with mysticism and that’s very much what’s at play here, as the Imperials have uncovered not only historical and physical artifacts but also an enigmatic painting of the “Mortis Gods” towering over Loth-wolves. First introduced in what’s come to be known as the “Mortis trilogy” of Star Wars: The Clone Wars (season 3 episodes “Overlords,” “Altar of Mortis,” and “Ghosts of Mortis”), the Father, Son, and Daughter of Mortis were physical manifestations of the various aspects of the Force. Here, the trio function as a puzzle to be unlocked and guardians of a gateway into the Jedi temple. Emperor Palpatine (voiced here by none other than the great Ian McDiarmid who played him in the films) has taken a great interest in the temple because of the power it holds behind this gateway and has tasked someone he trusts implicitly, a new character by the name of Minister Veris Hydan (voiced by the deliciously creepy Malcom McDowell), with overseeing the excavation. Palpatine does express mild concern to Hydan over how Kanan’s death will affect the fate of Lothal, but it is not enough to dissuade the Sith lord from pursuing the secrets hidden within the temple. Similarly, Hera conveys doubts about proceeding with their operation once it becomes apparent that Palpatine has taken such a personal interest. But ultimately, Ezra convinces her to continue because if the Emperor views the project as this important, then it absolutely must be stopped. Sabine’s artistic ability, another trait that Rebels has consistently established, is soon put to use in interpreting the Mortis symbols. Employing a holographic copy of the stone given to Ezra by the Loth-wolves, Sabine interprets the ancient symbols in the Mortis painting and encourages Ezra to start with the Daughter in his attempt to open the gateway. Bridger follows her advice, mimics the Daughter’s hand position, and uses the Force to cause the painting’s lines and rings to rotate. The painting itself animates (thanks to Ghostbot, the studio behind Forces of Destiny) and the Loth-wolves form a rotating ring that serves a gateway into the Jedi temple. Ezra wastes little time going through the portal and finds himself in a vast and mystifying realm of pathways that lead to various points in time and space. “A World Between the Worlds,” the name of this week’s second episode, is an apt description of where Ezra finds himself. White-outlined paths stretched across a field of stars, this in-between place is filled with the voices of myriad Star Wars characters (e.g., Yoda, Obi-Wan, Maz Kanata, etc.) throughout the saga and seems to serve as a conduit to various scenes featuring the characters. This place literally and figuratively connects every aspect of the Star Wars universe, and the effect is goosebump-inducing. Having already borrowed from J.R.R. Tolkein and his Lord of the Rings, Dave Filoni and company seem to now be paying tribute to his good friend C.S. Lewis, whose “Wood Between the Worlds” functioned in much the same way and was featured prominently in The Magician’s Nephew, chronologically the first book in the Narnia series. Of all the portals he sees, Ezra is drawn to one in particular because of a convor perched on its top. Approaching closer, Ezra witnesses the duel between Darth Vader and Ahsoka Tano from the end of “Twilight of the Apprentice,” an event that occurred two years ago. Acting instinctively, he decides to pull Ahsoka through the portal and out of Vader’s reach just as the Dark Lord of the Sith seems primed to strike the killing blow. It has been speculated that it had always been Ahsoka’s fate to be saved by Ezra in a time paradox that would make James Cameron proud, and Dave Filoni himself seemed to lend credence to this theory with his comments on the latest Rebels Recon about Ahsoka re-entering the Sith temple on Malachor, but there seems to be no definitive answer on this. Upon her return, Ahsoka finally gives us a clue as to the identity of “Dume,” the giant Loth-wolf who has been communicating with Ezra. According to her, the wolves are intrinsically connected to the Force that someone like Kanan who has become part of the Cosmic Force may be able to influence them to do their will. Ezra is fascinated by this and emboldened by the power to save his friends from death (a power that has tempted at least one Jedi to fall to the Dark Side), so decides to try to save Kanan just like he saved Ahsoka. However, Ahsoka convinces him this decision would doom his friends and render Kanan’s sacrifice meaningless, so Ezra relents at the last minute and again allows Kanan to die saving his friends. One of the themes of the “Mortis” trilogy was the role of destiny and one’s ability to change it, so it makes sense that this tension would resurface in an episode that hearkens back so clearly to that trio of stories. But what I’m interested in most are the ramifications of Ezra bringing Ahsoka back. Emperor Palpatine is eager to control the Lothal Jedi temple because of its access to all time and space, for the ability to alter history at will certainly falls into the category of “unlimited power” of which Sheev is so fond. “A World Between the Worlds” makes it very clear that Palpatine gaining this power would be disastrous for his enemies. In fact, when the Emperor himself finds a way to access this realm in pursuit of not only its power but also of Ahsoka and Ezra, the two Force-wielders make a desperate escape and vow to seal off the temple so that Palpatine can never access it again. And though Ahsoka acknowledges that she cannot exit the temple with Ezra as she belongs to an earlier part of the timeline, there is no mention of the danger in bringing her back. Saving Kanan meant killing Hera, Sabine, and an earlier version of himself, so Ezra’s decision to let him die is a logical one. But his choice to reintroduce Ahsoka into the mix has wide-reaching implications both in-universe and without, for if Ezra sees no problem with manipulating time and space–even if it’s for the greater good–how different really are his motivations from the Emperor’s? Perhaps that is simply another question that Star Wars Rebels has raised that won’t receive a definitive answer. Ezra closes the Jedi temple shortly after he and Ahsoka exit, and that particular temptation seems to be off the table for now. As he engages the painting of the Son with his closed fist, the icon serves as a counterpart to that of the Daughter with her open hand in yet another elegant commentary on the balance of the Force. The Jedi temple buries itself with the majority of its mysteries still intact. And as Star Wars Rebels wraps up next week with our heroes taking on one last mission, we’ll finally get to see which of its remaining threads are resolved and which are left for us to debate.